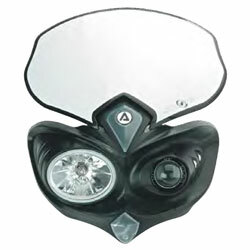 The first approved headlight for all on and off-road bikes. It can be used on non-fairing bikes to street fighters. Exclusive customized design: nylon surround, polypropylene number plates, polycarbonate reflector, cast aluminum headlight body and tempered glass lens.